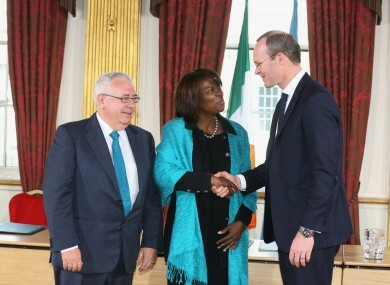 Junior Minister Joe Costello, UN WFP executive director Ertharin Cousin and Simon Coveney. THE IRISH GOVERNMENT has agreed to give at least €21 million to the UN’s World Food Programme (WFP) over the next three years. The deal was signed at Dublin Castle today during a major international conference discussing climate change, hunger and poor nutrition. In addition to the core contribution of a minimum of €7 million a year, which will be funded by the Department of Agriculture, Food and the Marine, the Department of Foreign Affairs and Trade will continue to provide funding in response to humanitarian emergences. WFP executive director Ertharin Cousin recognised Ireland’s current economic climate, noting it was “hard to give when times are tough at home”. “That makes this contribution all the more valuable to us as we continue our vital work among the world’s hungry poor,” she added. This week’s event, Hunger – Nutrition – Climate Justice 2013, in Dublin Castle is exploring the links between climate change, hunger and poor nutrition, and their impact on the world’s most vulnerable communities. The two-day conference, which is co-hosted by Ireland and the Mary Robinson Foundation, is due to hear from about 100 people from grassroots communities. A keynote address was given by Joyce Banda, president of Malawi, through a video link earlier today. She said people in her country “feel the consequences” of climate change and hunger every day. She appealed to world leaders to “recognise the impact of climate change on the poor and develop mechanisms for funding programmes for basic needs, such as food, water and energy”. Ahead of today’s opening speeches, former president Mary Robinson told reporters that “it is a scandal” that one in seven people in the world are hungry and that children are stunted from malnutrition. “We have to address it better,” she said, adding that planning needs to be done in partnership with those on the ground. President Michael D Higgins also attended Dublin Castle today, officially opening the conference. Email “Ireland to give €21 million to World Food Programme”. Feedback on “Ireland to give €21 million to World Food Programme”.